Merry Christmas to all my readers! Probably won't get another post up before the New Year, so here's wishing you many happy miles of driving. Don’t think I’ve knowingly posted any fiction on here before, though some of the press releases I receive are rather dubious. So here’s a short story dealing with a couple of intrepid seniors and a classic car. Eleven forty-five on a sunny autumn day. Nothing stirs in the parking lot of the Golden Oaks Seniors Residence. The halls of the residence are quiet too as most of the seniors are already in the dining room waiting for lunch to be served. Everyone but Emily Woo and Walt Winterburn, standing behind one of the lounge windows, the curtains pulled shut, taking turns peering out. A powder blue ’51 MG TD Midget convertible turns into the driveway. Emily nods her head, white curls bouncing. “Here comes dutiful daughter Dorinda now.” She tugs a soft-brimmed hat over her curls, and pulls a pair of leather gloves from her purse. The car sweeps past the clearly marked visitor parking and pulls up in front of the door of the Golden Oaks Seniors Residence. The middle-aged Asian woman behind the wheel turns off the ignition and exits the car. “She left the keys in the ignition,” Walt reports. Walt pulls a bomber jacket on over his checked shirt, and flips the end of his grey flannel scarf over his shoulder. He tucks a small bottle of champagne into the picnic basket sitting on the table behind them, hoists the basket and walks out as Emily continues to monitor Dorinda’s progress. Reaching the door, Dorinda checks the time on her cell phone, shakes her head, purses her lips and pushes through into the hallway, stiletto heels clacking as she heads for the nursing station at the far end. She stalks past Walt without seeing him. Walt pushes the door open and glances outside. There’s no one in the parking lot so he sprints straight for the car, placing the basket on the floor of the passenger side. He looks around again, whips a pair of aviator glasses out and puts them on, then eases carefully into the driver’s seat of the MG. He starts the car, then gets back out and goes around to get into the passenger seat. Emily listens as the clacking heels go past the lounge and down the hall. There’s a shrill buzz as Dorinda slams the bell at the nursing station. As Emily exits the lounge and heads for the front door she hears one of the nurses ask Dorinda if they can help her. Emily smiles. You’d better believe it, she thinks as she opens the door. Walt waves to her from the car. She scurries towards it, her leather driving shoes making no noise on the pavement. She climbs over the door into the car, causing Walt to raise an eyebrow. Emily laughs and they high-five each other. Then she eases the car into gear. The door of the Golden Oaks burst open, and Dorinda stands in the doorway, panting and shaking her fist. Emily toots the car horn, guns the engine, and she and Walter scorch their way across the parking lot to the main road and the open highway beyond. 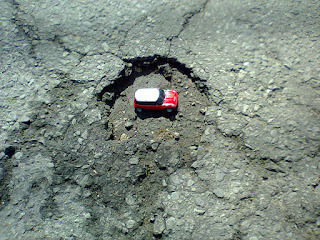 I’m not sure whether our roads are worst in the spring, when the freeze and thaw cycle has made old potholes bigger and created new ones, or right now when the potholes are hidden by the snow and slush filling them. Either way, they’re bad. 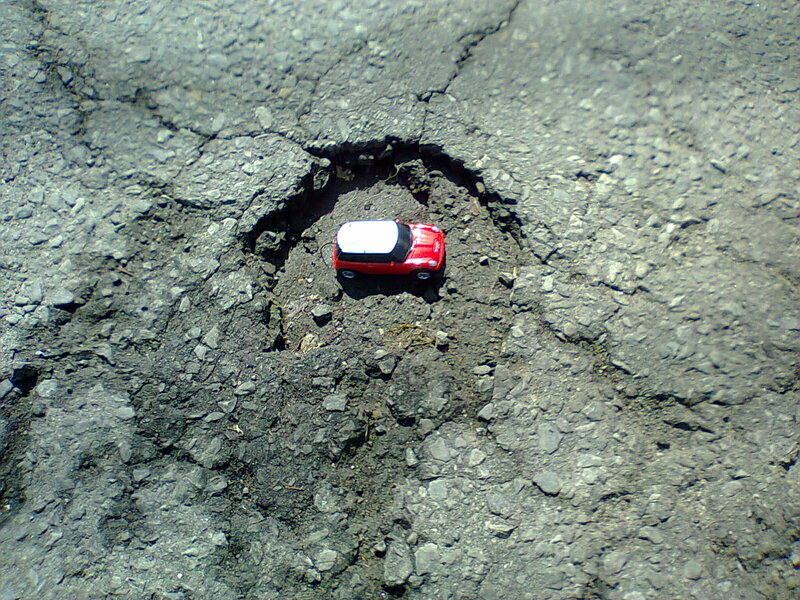 The Canadian Automobile Association does an annual survey of the worst roads in Canada, with the hope of giving those in charge a push to do something about them. You can find a list of the worst roads in Quebec, listed by region, HERE. I’m pasting their list of the worst roads in Montreal below. Judging by the names, they’re ignoring those of us in the ‘burbs, but some of ours are pretty bad, too. How about it, guys? Do you agree, or do you regularly drive one that’s even worse?